Bhaskara-2 was the Indian earth observation satellite, second in the series titled “Bhaskara”. The satellite was named in commemoration of the great Indian mathematician and astronomer of the same name, who lived in 12th century A.D. The satellite was built under the same concept of its precursor Bhaskara-1, which belonged to the category of remote sensing missions. Bhaskara-2, as an improved variant of the earlier satellite, was launched from the Soviet cosmodrome Volgograd Launch Station by the launching rocket C-1 Intercosmos Launch Vehicle, on 20th November 1981. Bhaskara -2 was deployed in outer space in a near circular orbit of 541 x 557 kilometers at an inclination of 50.635 degrees. It carried an improved payload (over its predecessor) built to study the solar cell degradation. The mission life was for one year and the orbital life lasted ten years when the satellite re-entered in 1991. A special care was taken to ensure that the snags experienced by Bhaskara-1 were not to recur in the successor. The two-band TV camera system and SAMIR (Satellite Microwave Radiometer) had developed hitches in Bhaskara-1 resulting in electrical snags and the camera eyes remained closed for almost a year. Although Bhaskara-1 had earned the nickname of being “blind but not dumb”, the cameras sprang to life belatedly after one year sending the images scanning an area of 90,000 square kilometers during its two-time passover above India. SAMIR is particularly useful in understanding land-sea-atmosphere interaction by the data generated on soil moisture, ocean surface characteristics and biomass features while measuring microwave radiation emission from the earth. The special advantage of microwave remote sensing technique it can function well in the night too since it does not require sunlight. 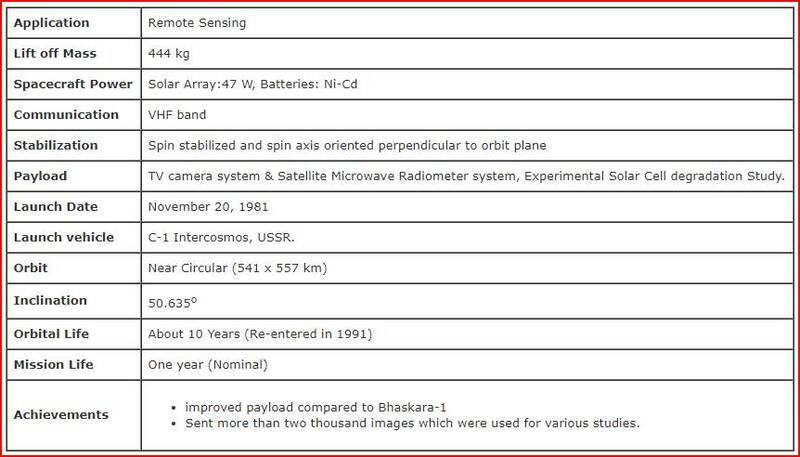 In Bhaskara-2, the mission of remote sensing was distributed such that microwave sensors were to perform night duty whereas the TV cameras had to work using sunshine. Bhaskara-2 was also entrusted with the onus of carrying out the functions its predecessor failed to perform. Bhaskar-2 was also to complete the task of acting as a relay station to transmit the data collected from the unattended remote area ground platforms located in various parts of India through the onboard VHF responder to the manned earth stations. Bhaskara-2 had formed the foreground and offered considerable practical experience for Indian space scientists who later took on the more ambitious projects like INSAT.